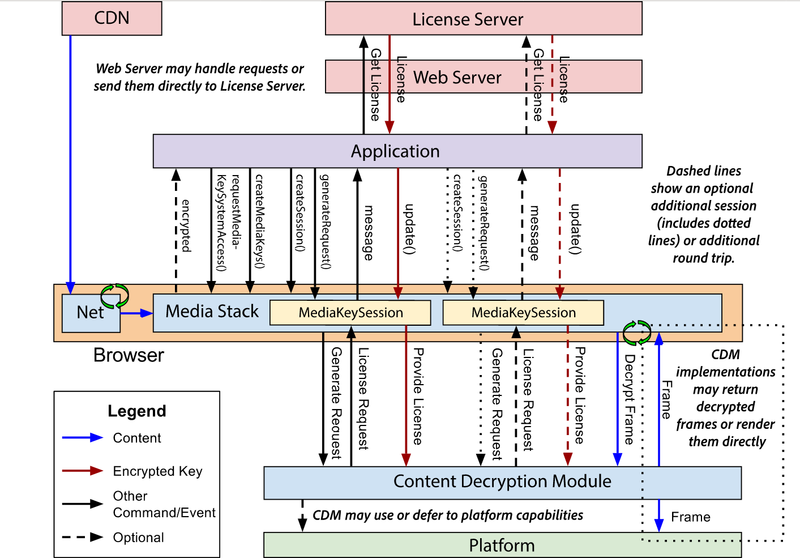 This proposal extends HTMLMediaElement [HTML5] providing APIs to control playback of encrypted content. The Clear Key system requires that content be encrypted, but the keys to decrypt it are passed in cleartext. I will return to the implications of this requirement. What is DRM trying to achieve? Ostensibly, it is trying to ensure that each time DRM-ed content is rendered, specific permission is obtained from the content owner. 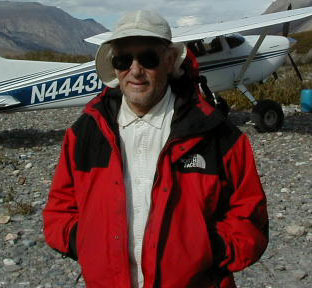 In order to ensure that, the CDM cannot trust the browser it is running in. For example, it must be sure that the browser can see neither the decrypted content nor the key. If it could see, and save for future use, either it would defeat the purpose of DRM. The CDM is running in an environment controlled by the user, so the mechanisms a DRM implementation uses to obscure the decrypted content and the key from the environment are relatively easy to subvert. This is why in practice most DRM technologies are "cracked" fairly quickly after deployment. As Bunnie Huang's amazing book about cracking the DRM of the original Xbox shows, it is very hard to defeat a determined reverse engineer. So if DRM isn't anti-piracy, what is it? DRM isn't really a technology at all, it's a law. Specifically, it's section 1201 of the US DMCA (and its international equivalents). Under this law, breaking DRM is a crime with serious consequences (5 years in prison and a $500,000 fine for a first offense), even if you're doing something that would otherwise be legal. This lets companies treat their commercial strategies as legal obligations: Netflix doesn't have the legal right to stop you from recording a show to watch later, but they can add DRM that makes it impossible to do so without falling afoul of DMCA. It lets companies sue and threaten competitors who want to let you do more with your property -- get it repaired by independent technicians, buy third-party parts and consumables, or use it in ways that the manufacturer just doesn't like. Of course, among the "ways that the manufacturer just doesn't like" can be archiving. IANAL, but I do not believe that it is a defense under the DMCA that the "protections" in question are made of tissue paper. Thus, for example, it is likely that even an attempt to reverse-engineer an implementation of EME's Clear Key system in order to preserve the plaintext of some encrypted content would risk severe criminal penalties. Would an open source implementation of Clear Key be legal? Also deeply disappointing is Berners-Lee's failure to recognize the seriousness of the threat that EME represents to security researchers. The problem is that once DRM enters the equation, the DMCA comes into play, with heavy penalties for those who dare to reveal flaws, as the EFF explained two years ago. Google's CDM is Widevine, a technology it acquired in 2010. David Livshits, a security researchers at Ben-Gurion University and Alexandra Mikityuk from Berlin's Telekom Innovation Laboratories, discovered a vulnerability in the path from the CDM to the browser, which allows them to capture and save videos after they've been decrypted. They've reported this bug to Google, and have revealed some proof-of-concept materials now showing how it worked (they've withheld some information while they wait for Google to issue a fix). Widevine is also used by Opera and Firefox (Firefox also uses a CDM from Adobe). Under German law -- derived from Article 6 of the EUCD -- Mikityuk could face criminal and civil liability for revealing this defect, as it gives assistance to people wishing to circumvent Widevine. Livshits has less risk, as Israel is one of the few major US trading partners that has not implemented an "anti-circumvention" law, modelled on the US DMCA and spread by the US Trade Representative to most of the world. The researchers who revealed the Widevine/Chrome defect say that it was likely present in the browser for more than five years, but are nevertheless the first people to come forward with information about its flaws. As many esteemed security researchers from industry and academe told the Copyright Office last summer, they routinely discover bugs like this, but don't come forward, because of the potential liability from anti-circumvention law. a binding promise that W3C members would have to sign as a condition of continuing the DRM work at the W3C, and once they do, they not be able to use the DMCA or laws like it to threaten security researchers. How do we know that companies only want DRM because they want to abuse this law, and not because they want to fight piracy? Because they told us so. At the W3C, we proposed a compromise: companies who participate at W3C would be allowed to use it to make DRM, but would have to promise not to invoke the DMCA in these ways that have nothing to do with piracy. So far, nearly 50 W3C members -- everyone from Ethereum to Brave to the Royal National Institute for Bind People to Lawrence Berkeley National Labs -- have endorsed this, and all the DRM-supporting members have rejected it. In effect, these members are saying, "We understand that DRM isn't very useful for stopping piracy, but that law that lets us sue people who aren't breaking copyright law? Don't take that away!" But that's not what I came to tell you about. Came to talk about the draft archiving. Another way of expressing the same thought is that HTML5 allows content owners to implement a semi-effective form of DRM for the Web. For books, yes this could be a problem, because there have been a large number of closed non-web devices which people are used to, and for which the publishers are used to using DRM. For many the physical devices have been replaced by apps, including DRM, on general purpose devices like closed phones or open computers. We can hope that the industry, in moving to a web model, will also give up DRM, but it isn't clear. It's also totally different from the Web that Berners-Lee invented in 1989, and then generously gave away for the world to enjoy and develop. It's truly sad to see him acquiescing in a move that could destroy the very thing that made the Web such a wonderfully rich and universal medium -- its openness. content ... saved locally from a Web page ... being accessed without further restrictions. It appears that the W3C's EME will become, in effect, a mandatory feature of the Web. Obviously, the first effect is that much Web video will be DRM-ed, making it impossible to collect in replayable form and thus preserve. Google's making Chrome's video DRM impossible to disable suggests that YouTube video will be DRM-ed. Even a decade ago, to study US elections you needed YouTube video. Advertising-supported content. The market for Web advertising is so competitive and fraud-ridden that Web sites have been forced into letting advertisers run ads that are so obnoxious and indeed riddled with malware, and to load up their sites with trackers, that many users have rebelled and use ad-blockers. These days it is pretty much essential to do so, to keep yourself safe and to reduce bandwidth consumption. Sites are very worried about the loss of income from blocked ads. Some, such as Forbes, refuse to supply content to browsers that block ads (which, in Forbes case, turned out to be a public service; the ads carried malware). DRM-ing a site's content will prevent ads being blocked. Thus ad space on DRM-ed sites will be more profitable, and sell for higher prices, than space on sites where ads can be blocked. The pressure on advertising-supported sites, which include both free and subscription news sites, to DRM their content will be intense. Thus the advertising-supported bulk of what we think of as the Web, and the paywalled resources such as news sites that future scholars will need will become un-archivable. Kalev Leetaru will need to add a fourth, even more outraged, item to his list of complaints about Web archives. The prospect for academic journals is somewhat less dire. Because the profit margins of the big publishers are so outrageous, and because charging extortionate subscriptions for access to the fruits of publicly and charitably-funded research so hard to justify, they are willing to acquiesce in the archiving of their content provided it doesn't threaten their bottom line. The big publishers typically supply archives such as Portico and CLOCKSS with content through non-Web channels. CLOCKSS is a dark archive, so is no threat to the bottom line. Portico's post-cancellation and audit facilities can potentially leak content, so Portico will come under pressure to DRM content supplied to its subscribers. One thing it should be easy to agree on about digital preservation is that you have to do it with open-source software; closed-source preservation has the same fatal "just trust me" aspect that closed-source encryption (and cloud storage) suffer from. there may also be an oligopoly issue, because the content market will depend on four, and perhaps soon only three, major DRM services players: Google, Microsoft, and Apple. All of these companies have their own operating systems, so there is also less incentive for them to support other platforms in their DRM solutions. So it may not even be possible for Web archives to render the content even if the owner wished to give them permission. "The World Wide Web Consortium (W3C), the standards body that oversees most Web-related specifications, has moved the EME specification to the Proposed Recommendation stage. The next and final stage is for the W3C's Advisory Committee to review the proposal. If it passes review, the proposal will be blessed as a full W3C Recommendation." Cory Doctorow's comment on this "next step" is here. Firefox is now "Netflix approved" i.e. it has HTML5 DRM support. Once I've upgraded I'll see if I can turn it off. "Caution has been expressed by Frank La Rue, Assistant Director General for Communication-Information, in a letter sent to the W3C, a standards-setting body that is considering a change to internet browsing with potentially far-reaching consequences. The technical change is known as Encrypted Media Extensions” (EME), which would become part of the HTML 5 code for the World Wide Web, and therefore standardize how web browsers deal with encrypted video content. Encryption of video content is something that largely serve the interests of the copyright industry, but it also has significance for network security and content integrity. If agreed, the new EME standard could mean that internet browsers might increasingly “act as a framed gateway rather than serving as intrinsically open portals”, said La Rue." At least in Ubuntu, the "Play DRM Content" preference appears to be off by default. "Similar opt-out capabilities will be offered on all new platforms where Firefox supports DRM." "German Member of the European Parliament Julia Reda ... has published an open-letter signed by UK MEP Lucy Anderson, raising alarm at the fact that the W3C is on the brink of finalising a DRM standard for web video, which -- thanks to crazy laws protecting DRM -- will leave users at risk of unreported security vulnerabilities, and also prevent third parties from adapting browsers for the needs of disabled people, archivists, and the wider public." "Portugal's parliament has approved a bill that will restrict how Digital Rights Management is applied to some creative works, including those in the public domain or funded by public entities. Even when DRM is present, citizens will be able to circumvent the protection for education and private copying purposes." Cory Doctorow points to a letter from Tim Wu to Tim Berners-Lee drawing the parallel between the anti-competitive effects of DRM for the Web, and those of the removal of net neutrality requirements. "Every Ozimal digirabbit in the venerable virtual world Second Life will starve to death (well, permanent hibernation) this week because a legal threat has shut down their food-server, and the virtual pets are designed so that they can only eat DRM-locked food, so the official food server's shutdown has doomed them all." Perhaps the awful fate of all the cuddly bunnies will soften hearts at W3C. In discussions at the recent Web Archiving Conference, Andy Jackson pointed out that the British Library has legal authority to ask publishers for DRM-free versions of their content for archival purposes. This is good, but it doesn't affect my argument for two reasons. First, the DRM-free content acquired by the BL would be accessible only to scholars physically at the BL, so it isn't useful in the way public Web archives are. Second, the cost of negotiating with individual publishers and setting up individual ingest pipelines for their DRM-free content would be prohibitive at scale, it would only be feasible for very important content such as newspapers. "Speaking on behalf of Berners-Lee in a note posted to the W3C mailing list, project management lead Philippe Le Hégaret said, "After consideration of the issues, the Director reached a decision that the EME specification should move to W3C Recommendation." EMEs will be published as a W3C Recommendation unless at least five per cent of the 475 members of the W3C Advisory Committee – composed of companies, non-profits, and educational organizations – support an appeal within 14 days. If an appeal it considered, members will have the opportunity to vote on whether to accept or reject the technology." See also Mike Masnick and Cory Doctorow. The EFF has appealed the W3C's decision. And Cory Doctorow points out the connection between the Net Neutrality and Web DRM fights. "HiQ scrapes data about thousands of employees from public LinkedIn profiles, then packages the data for sale to employers worried about their employees quitting. LinkedIn, which was acquired by Microsoft last year, sent hiQ a cease-and-desist letter warning that this scraping violated the Computer Fraud and Abuse Act, the controversial 1986 law that makes computer hacking a crime. HiQ sued, asking courts to rule that its activities did not, in fact, violate the CFAA." "argues sites wanting to limit access to their site should be required to use a technical mechanism like a password to signal that the website is not, in fact, available to the public. "It's hugely problematic to let the subjective wishes of the website owner and not their objective action" determine what's legal, Kerr told Ars." "Technological protection measures (TPMs) play a useful role in tackling copyright infringement, complementing legal provisions. However, they do not always stop at preventing illicit activities, and can often serve to stop libraries and their users from making fair uses of works. This can affect activities such as preservation, or inter-library document supply. To make it easier to apply TPMs, regardless of the nature of activities they are preventing, is to risk unbalancing copyright itself." "Final approval came after the W3C's members voted 58.4 percent to approve the spec, 30.8 percent to oppose, with 10.8 percent abstaining." " The bitter, yearslong debate at the World Wide Web Consortium over a proposal to standardize DRM for web browsers included frequent assurances by the pro-DRM side (notably Google, whose Widevine DRM was in line to be the principal beneficiary) that this wouldn't affect the ability of free/open source authors to implement the standard. Now the real world has arrived, and it was just as predicted." "Maddock wanted to allow his users to do this with the videos they pay to watch on Widevine-restricted services like Hulu and Netflix, so he applied to Google for a license to implement Widevine in his browser. Four months later, Google sent him a one-sentence reply: "I'm sorry but we're not supporting an open source solution like this" (apparently four months' delay wasn't enough time to hunt up a comma or a period). The connection to the Article 13 debate should be obvious: for years, advocates for the Directive insisted that it could be implemented without filters, but of course it requires filters. Likewise, for year, EME's backers insisted that it wouldn't prevent us from having open, auditable, free-as-in-speech browsers that anyone could inspect, improve and distribute. But of course it does."